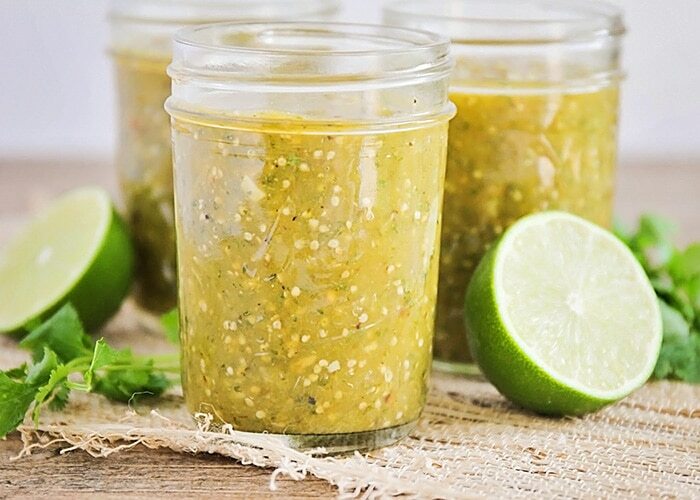 This delicious homemade tomatillo salsa recipe is sponsored by Heinz. It is the perfect accompaniment for your summer grilling recipes. It’s savory and flavorful, and easy to make! At our house, we eat salsa on just about everything. Scrambled eggs, tacos, burritos, enchiladas… we even love it on grilled chicken or fish! My kids love mild red salsa, but I’ve always been a green salsa girl. I love that it’s tangy, and I like it with some heat to it. 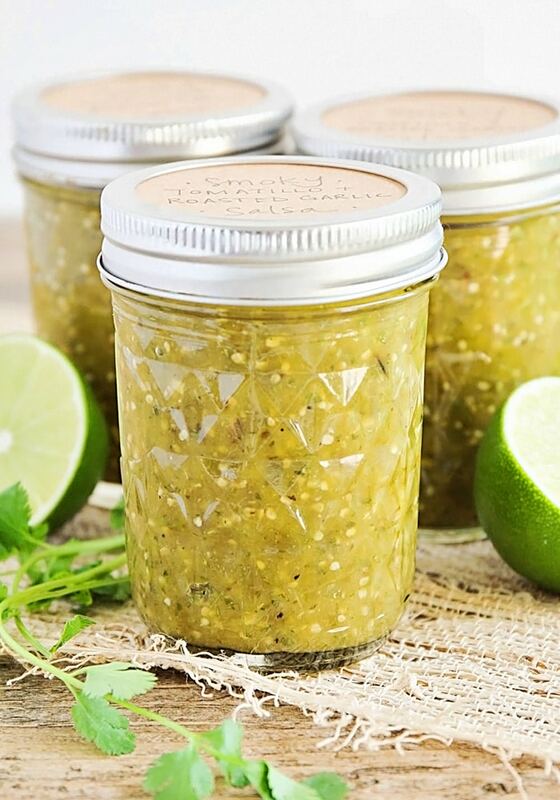 This homemade tomatillo salsa is full of delicious flavor from roasted garlic, tomatillos, and Anaheim peppers, and gets a delicious smoky flavor from roasting the vegetables in the oven. 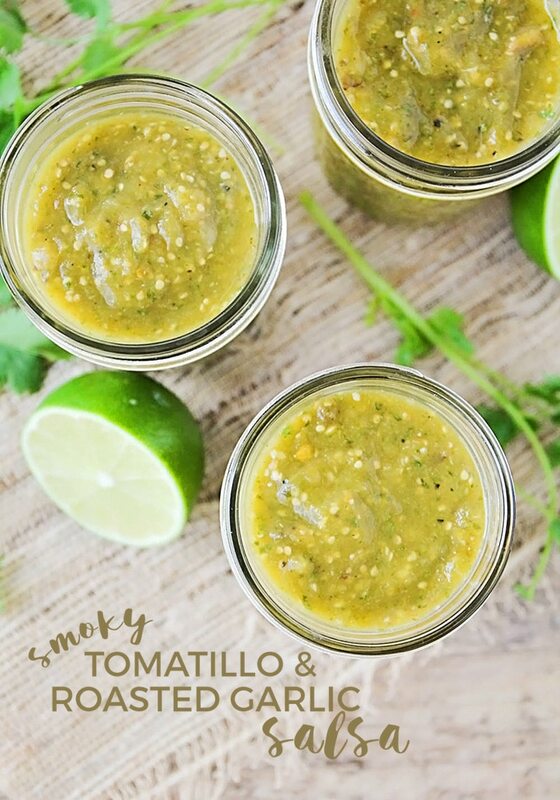 I’ve never made tomatillo salsa before, and I was really surprised by how simple and easy it is! 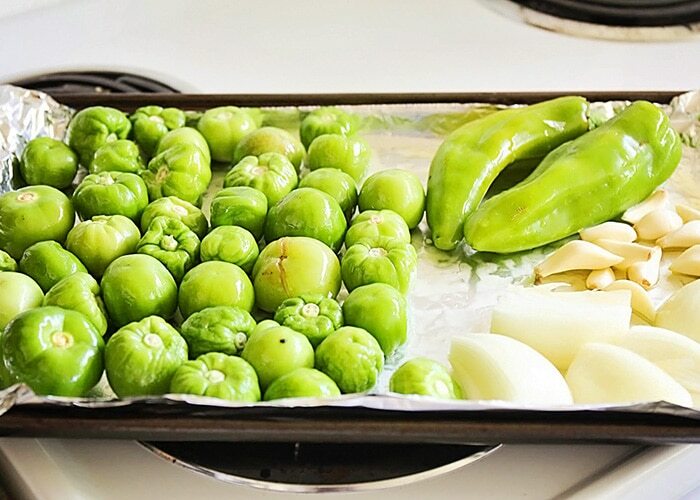 You’ll start by husking your tomatillos and placing them on a foil-covered baking sheet with some onions, garlic, and peppers. Roast the vegetables at 500 for 15-20 minutes, or until they are lightly charred. Those darker brown bits give the salsa extra flavor and make it super delicious! After the vegetables have cooled a little, you’ll peel the skin from the peppers, then add the vegetables to a blender or food processor. Add some cilantro, lime juice, and vinegar, and then process it until it’s the consistency you like. 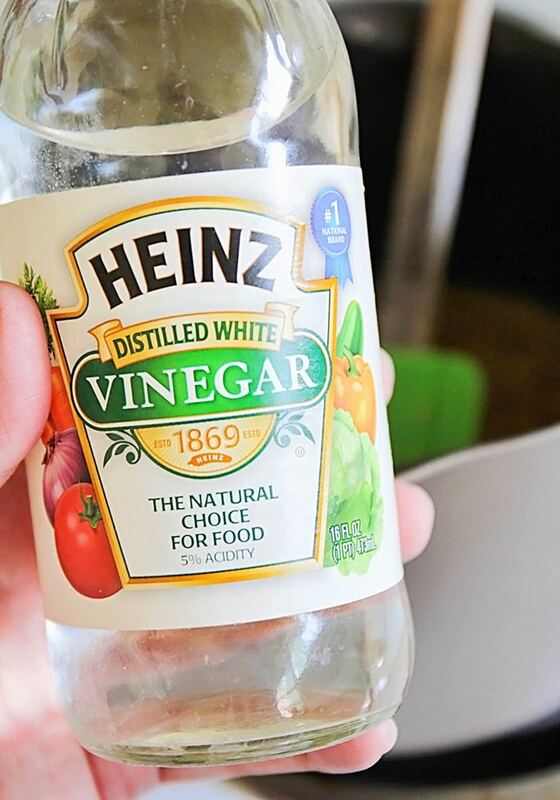 I used Heinz® Distilled White Vinegar, and it worked great. 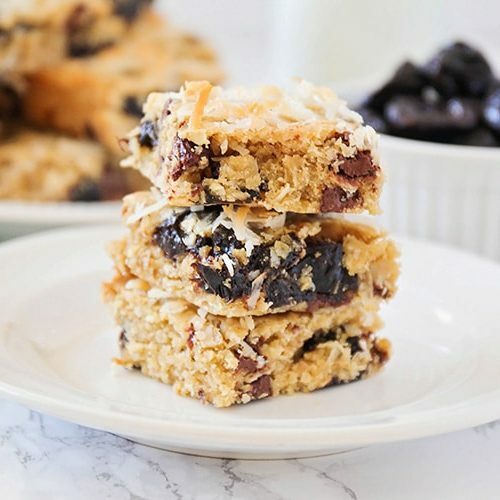 It’s all natural and made from sun-ripened corn, which makes it perfect for this simple and delicious recipe. Let the salsa simmer 5-10 minutes, then ladle into clean jars. 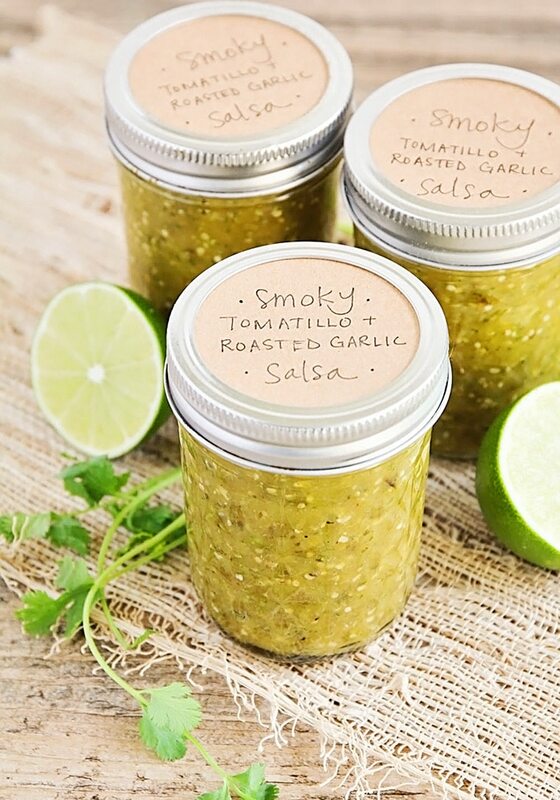 If you’re planning to can the salsa, make sure your jars, lids, and bands have been sterilized. If you don’t want all the bother of canning, the salsa will keep in the fridge for about a week. 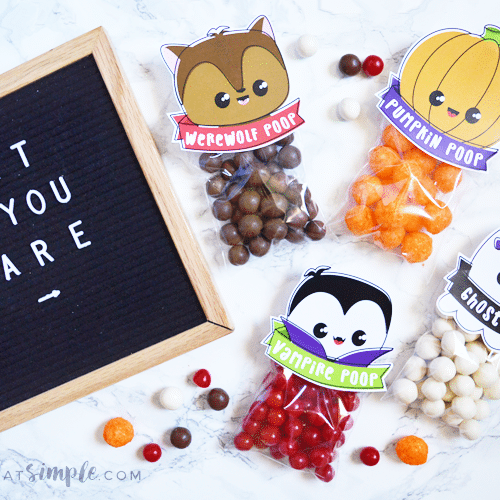 I think it makes a fun gift to share with friends! If you’re canning the salsa, I would definitely suggest doubling the recipe to get a full canner load. I got around 3 1/2 cups of salsa from one batch. 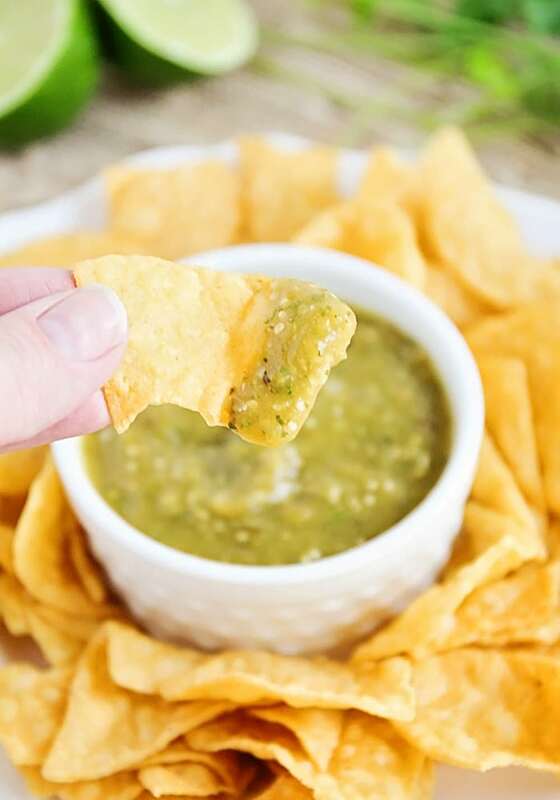 This homemade tomatillo salsa is delicious with tortilla chips, but it’s also a perfect complement for your summer grilling recipes. 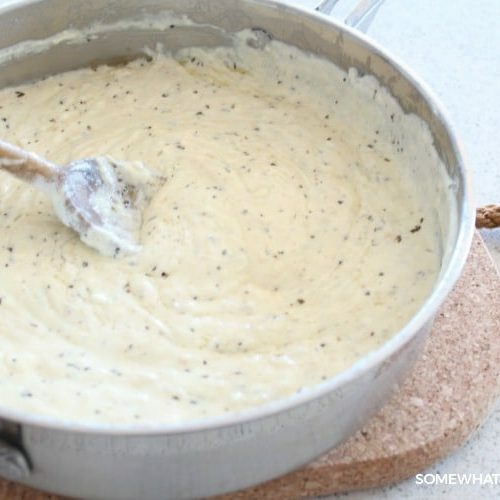 Try it with grilled chicken, fish, or pork. Preheat the oven to 500. Line a baking sheet with foil and spray with cooking spray. 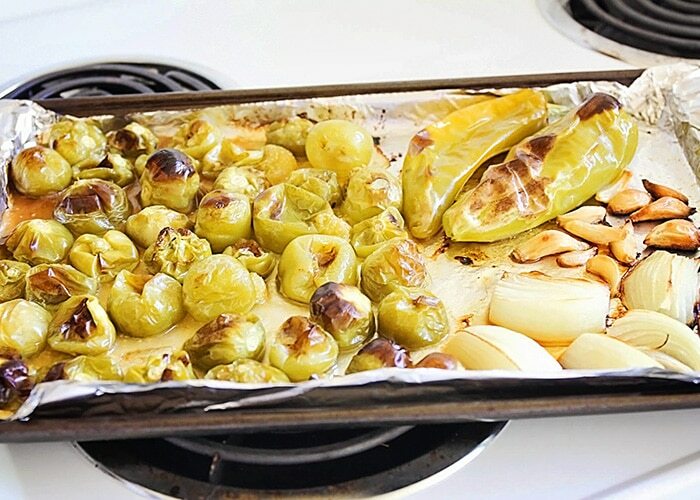 Place the tomatillos, onion, garlic, and peppers on the baking sheet. Roast 15-20 minutes, or until the tomatillos have charred slightly and are starting to release their juices. Remove from oven and let cool slightly. After the peppers have cooled, carefully peel off the skin. It’s a good idea to wear gloves to prevent getting spicy pepper juice on your hands and then inadvertently rubbing it in your eyes. If you want your salsa spicier, leave the pepper seeds in, or for a milder salsa scrape them out. 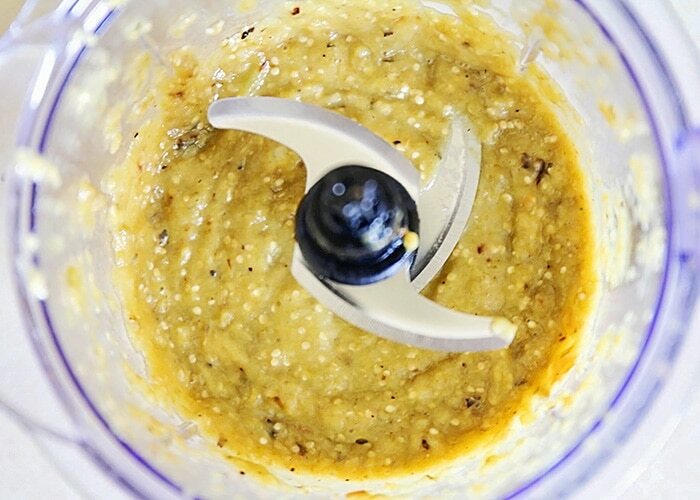 Add the tomatillos, peppers, onions, and garlic to a blender or food processor. Then, add the cilantro, lime juice, vinegar, salt, cumin, and red pepper flakes, and pulse until it’s as chunky or smooth as you would like it. Add water as needed to thin to desired consistency. Pour the mixture into a medium saucepan and heat just to a simmer. If you’re planning to refrigerate the salsa, ladle into clean containers, then let cool. Use within one week. To use this recipe for canning, start by doubling the recipe. After the salsa reaches a simmer, ladle into sterilized jars, leaving 1/2 inch headspace. Add sterilized lids and bands. Process in a water bath canner for a minimum of 15 minutes, adding 5 minutes for each 2000 feet of altitude above sea level. Let cool, then store in a cool, dry place. Use within six months. For more delicious recipes, visit the pickling and canning section of Kraft foods!